I had such a good time and the conversation´s were so amazing i wondered why do we need drugs to connect eith people? 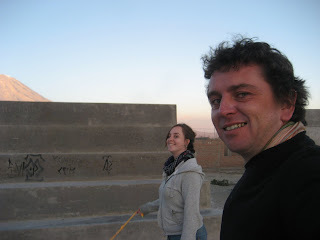 People are people, when i had great conversations on Ayhuasca, i wondered, why cant we do this without drugs? Me being quite was freaking Tulassi out, so he put a black alabaster stone on my head, to bring me back to the cave, i was quite happy with the stroll with my friend on that island. It was quite reassuring that the plant told me there was nothing left to reveal, all i have to do is get to Peru and start volunteering and put everything into pratice. I feel like i am really happy with myself and life after Diana, which must of been the haredest thing i have ever had to deal with. But the path is very cear now, it seems like another side of me has been revealed to me and this was quite unexpected for me, but very encouraging and exciting. I felt so happy to be me and as long as i have my sense of humor, i have everything i will ever need. Maire (the Canadian) told me she had a dream that i was broke, dream on love!!!! At 1 point Tulassi checked the time and even though a whole night felt like it went past, it was only 1am, somehow the next hour turned to 5.30, time ws very strange in that cave. The quotes and things we were saying were comedy gold and it being dark, i couldn´t write anything, it was one of the funniest nights i have ever had. At one point i was tying to smoke the little pipe and i couldn´t get the hang of it, this went on for ages. But time flew all the same. I could feel this other new side of me kick in. So the insight was keep being y ourself, everything is fine, put all you´ve learnt into pratice. I felt like i got as much as i could from the plant. I dont feel like i need more and of coure Tulassi sang ´Neil Cassidy´ twice, the first time he sang it, i never felt so happy to hear any other song that meant as much in my lie. ´Say his name and you were born to be, born to be, Neil Cassidy´ Genius!!!! Brian at one point just laughed at everything i was saying, he thought if i was saying it, it must be funny. Maybe i could be a comedian after all, all i have to do is speak clearly, easier said than done, my friend, i can do it, but i cant say it, what ever it is anyways? I couln´t wait until sunrise and go out and toast myself in the sun. It felt amazing when it came around. 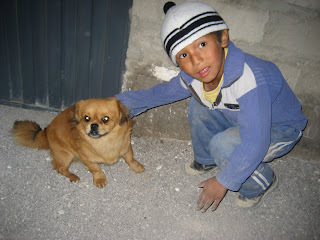 Kid from the school, with his gay dog, that likes dogs twice his size, impressive little gay fellow!! So we made it back to Tulassis and myself and Brian commisioned new necklaces to remember this Ayhuasca experience and then we went for breakfast. The womans husband in the restaurnt can only remember 1 thing, so if you asked for a beer and salt shaker, you would get nothing, we swore we would never come back. To morrow i leave and the future i crystal clear again. I am going back to Oz in Dec and it is the righ thing, great things await and it will be summer time and everybody will be happy, ellentente!! !